The first type of shifting is something we are all familiar with: shifting up (towards the body of the guitar) or down (towards the headstock) the neck. 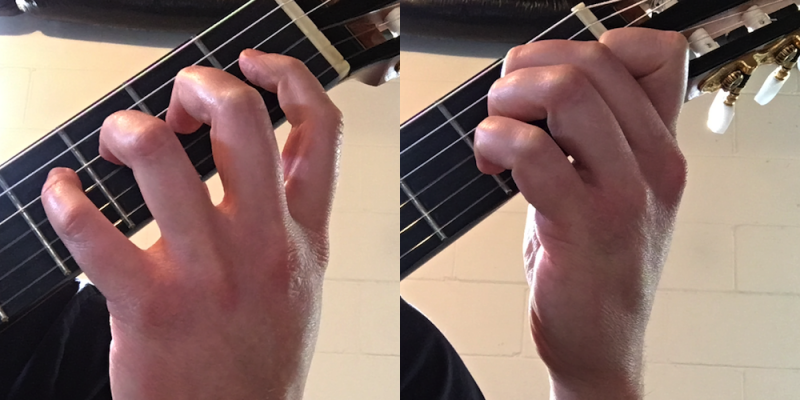 The second type of shifting, however, is one we all do every single time we pick up the guitar, but rarely think much about: shifting between an angled and straight left hand position. Both of these shifts are important and useful. So if we all do this all the time, why bother pointing it out? The more we take in — the more we observe and think about — the more we can practice. It’s important to account for both types of shifting so difficult passages and be worked out in such a way that the various shifts happen consistently each time. Practice is about building muscle and musical memory. It’s important that each perfect repetition is done in exactly the same way. That’s an impossible task, but the more things we notice and factor into each repetition the more effective our practicing gets.